Kadiddlehopper: Burdastyle 7936, the "Liz"
After Gertie made this blouse last year, I immediately downloaded the pattern and printed it. And then got distracted. But I finally got around to it! The pattern is Burdastyle 7936, AKA the "Liz" blouse. The fabric I used is a super lightweight swiss dot from FabricMart. 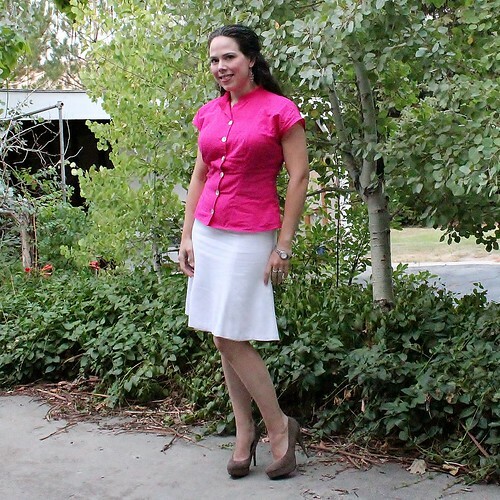 It is a very basic blouse with shoulder princess seams, kimono sleeves and a stand collar. It went together well and quite quickly, except for my own errors. Oh, that darn collar! For some reason, I just couldn't get it to attach well! I don't think it's a pattern issue, I was just having a bad sewing day. Can you see the big giant glaring error I made? If you look closely at the collar you can see that the collar stand is actually WRONG SIDE OUT!! And I didn't even realize it until the collar was on (for the third time! ), serged and topstitched. I decided I didn't care. There was no way I was going to rip out all that topstiching and serging. I'm pretty happy with the fit, particularly in the back, but you can see that this might not have been the best fabric choice, or that perhaps an underlining would have been a good idea. This was taken first thing in the morning, so it's not like I had sat around on it all day and it is already super wrinkled. The fabric is so light that it doesn't really skim my body well, instead it settles in the "valleys", which I don't think is particularly flattering. My first thought when I saw the collar was that you intended for it to be that way, a design element if you will. It's a good looking style, and the color is so pretty on you, I hope the magic closet performs it's magic! I think the collar looks okay even though it is wrong side out. As the designer, this could be your right side design intention. 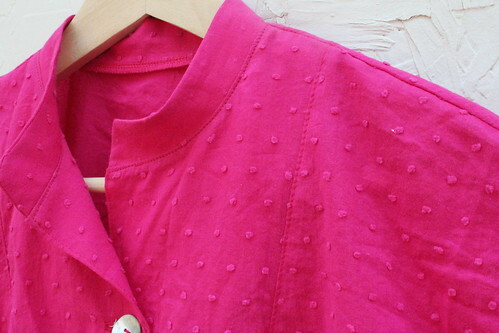 It is a cute blouse and one I have seen at Burda Style. Isn't it so hard to get that perfect meeting of pattern, fabric, and fit? Hmmm, I don't think I've ever actually done it (: Maybe in kids' clothes, here and there. But the pattern is really pretty. Since the collar stitching doesn't look wonky (from here), the "fabric variation" certainly doesn't look like an error.